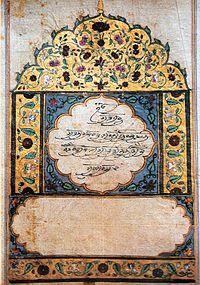 The Mul Mantar (Punjabi: ਮੂਲ ਮੰਤਰ, Mūl Maṃtar, pronounced Mool Mantar) is the first composition in the Sikh holy text and Great Living Guru, the Sri Guru Granth Sahib, written in Punjabi. It is a series of affirmations and is the basis of Sikh theology, as well as the fundamental prayer. The Mul Mantar is the first composition of Guru Nanak Dev Ji. The Guru Granth Sahib begins with the Mul Mantar and it occurs more than one hundred times throughout the text where it is placed at the beginning of the particular Shabad. Bhai Mani Singh explains that the reason for placing the Mul Mantar at the beginning of a Shabad is that a Gursikh (Guru's Sikh) should remember that everything else will eventually be annihilated. Only the Satnam (All-pervading Supreme Reality) will remain. It can be considered as the moral or the sole truth of the universe. The Mul Mantar is the most widely known part of Sikh scripture but it has posed a challenge to translators. Traditionally the Mool Mantar in its full Naad goes from Ik Oankar until Nanak Hosee bhee sach. The Mool Mantar in the full Naad is given in the Amrit Sanchar baptizing ceremony since 1699. SGPC and some groups are defining the Mool Mantar until Gurprasad. English: One universal Creator God who created the universe with the sound "Oang• Truth and eternal is the name• Doer of All • No Fear • No Hate • Timeless and deathless Form • Not affected by the circle of life and death - unborn • Self Extant • Self-Existent• He can be realized by the grace of the true and eternal Guru who has the power to enlighten us. You chant as many as times as you wish or as part of meditation. The word that follows, 'Jap' means to recite. A Mantar or Mantra is "an empowering formula for repetition". The Mul Mantar is thus the root statement of Sikhism. The Mul Mantar consists of nouns and adjectives but no verbs or pronouns. In addition, the nouns in the Mul Mantar do not have exact counterparts in European languages and the Gurmukhi script does not distinguish between upper and lower case letters. Thus, it poses a challenge to translators. The first affirmation, for example, Ik Onkar has been rendered multiple ways. It has been translated as "'There is one god', as ‘One reality is’, and ‘This being is one’" and the varying capitalization of "God", "Reality", or "Being" affects the meaning in English. A number of translations erroneously change the Mul Mantar from a list of qualities to a statement of facts and possessive adjectives. For example, they may change Satnam from "truth by name" to "His name is truth", which adds a masculine quality to God which does not appear in the original Gurmukhi. The traditional Gurmat school traces back directly to the Sikh Gurus. They state that the Mul Mantar ends with "Nanak Hosi bhi sach". Other groups of the 2o.th century believe that it ends by Gurprasad as in "provided by the Guru's grace." After this is the name of the Bani "Jap", and the first line of the Jap Bani. Such groups claim this can be corroborated by the number of times that the mantar appears at the beginning of every Raag. Others point out that in Gurbani it is also written "ek ong kar sat gur prasad" and that this does not represent an even more abbreviated form of Mul Mantar. ^ a b c d e Nesbitt, Eleanor M. (2005-11-15). Sikhism: a very short introduction. Oxford University Press. pp. 22–24. ISBN 978-0-19-280601-7. Retrieved 17 July 2010. ^ Kalsi, Sewa Singh; Marty, Martin E. (March 2005). Sikhism. Chelsea House Publishers. p. 47. ISBN 978-0-7910-8356-7. Retrieved 17 July 2010. ^ Singh, Bhai Mani (1712). Janam Sakhi. p. 11. Macauliffe, M.A (1909). The Sikh Religion: Its Gurus Sacred Writings and Authors. Low Price Publications. ISBN 81-7536-132-8. Shackle, C (1981). A Guru Nanak Glossary. School of Oriental and African Studies. ISBN 0-7286-0243-1. Singh, Dalip (1999). Sikhism in the Words of the Guru. Lok Sahit Prakashan. ASIN B0000CPD3S. Singh, Dr. Gopal (1962). Guru-Granth Sahib Vol.1. Taplinger Publishing Co.
Singh, Dr. Santokh (1990). English Transliteration and Interpretation of Nitnaym Baanees, Sikh Prayers for English Speaking Sikh Youth. Sikh Resource Centre. ISBN 1-895471-08-7. Osho (1994). The True Name, Vol.1 : Discourses on Japji Sahib of Guru Nanak Dev. New Age International(P) Ltd. ISBN 81-224-0606-8. Dr Sahib Singh, D Lit (Jan 1972). Shiri Guru Granth Sahib Darpan. Raj Publishers (Regd), Adda Husharpur Jallundhar. This page was last edited on 11 March 2019, at 17:15 (UTC).